Econram Systems accepts purchase orders from Fortune 500 companies, government and educational institutions for orders over $250. If your company or organization is required to use a purchase order and does not fit this description, please contact our orders department to qualify your order. Other Payment Methods can also be arranged. To submit a purchase order, please use the following guidelines. An e-mail address where we can deliver registration information. Billing address, contact person, phone number, and fax number. Shipping address, contact person, and phone number. Your Purchase Order terms and conditions, if used. Purchase orders can be faxed to EconRam Systems Orders at + 1 (310) 694-8022. Please note that we cannot process an order on a departmental purchase requisition. A company purchase order is required. If your Purchase Order indicates terms and conditions please include them with the order. Standard payment terms are net 30. Payment must be in U.S. dollars drawn on a U.S. Bank. You will receive a purchase order acknowledgment when we receive your completed purchase order. If EconRam Systems Orders does not hear from you by the next business day, we will process the order. International orders and inquiries can be placed via voice telephone to 310.694-8002.ECON, by facsimile to 310.694.8022, and via mail or e-mail - Info@econram.com. Please include your telephone number and e-mail address with your inquiries. Orders for shipment outside of the U.S. are subject to shipping fees, applicable customs, duties and taxes, all of which are the responsibility of the customer. All international orders must be prepaid in full with U.S. funds by wire transfer or cashiers check drawn from a U.S. bank. Econram Systems will not ship to freight forwarders unless product is for their internal use only. All international orders must ship directly to the end destination. 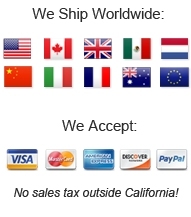 "Will-Call" orders are not accepted for international shipments. Econram Systems cannot drop ship physical products to an international location. Please note that certain products may not be exportable due to their classification. Also, certain brands may not be exportable for contractual reasons. Econram Systems reserves the right to deny an export for any reason. All commodities, technology or software are exported from the U.S. in accordance with the Export Administration Regulations. Diversion contrary to U.S. law is prohibited. Diversion, use, export or re-export contrary to U.S. law is prohibited. Export to the following countries is prohibited: Cuba, Iran, Sudan or Syria. In addition, products may not be exported or re-exported to entities and persons that are ineligible under U.S. law to receive United States commodities, technology and/or software.